Silversea have revealed details and images of their highly anticipated new expedition ship called Silver Origin. I believe it will redefine the luxury expedition cruise experience. The luxurious vessel has been designed to sail the Galapagos Islands and enable even deeper cultural immersion. It will also be one of the most environmentally friendly cruise ships ever built. The 100-guest, all-suite Silver Origin will debut in mid-2020. The pioneering design will give guests the chance to go deeper into the Ecuadorian culture and experience more of the natural beauty of the Galapagos Islands. See our full Silver Muse review with photos and video tours. Silver Origin has been designed for Galapagos expeditions. Silver Origin will have the highest Zodiac-to-guest ratio in the region – one for about every 12 guests. There will also be an expedition team certified by the National Park of the Galapagos as well as local cuisine, prepared by expert Ecuadorian chefs. Silversea tell me that the new cruise ship will be a luxurious outpost that can take guests closer to the authentic beauty of the Galapagos Islands in blissful luxury. Silver Origin will be perfectly crafted to make the most of your Galapagos experience. It will have an understated Italian elegance with bright, colourful motifs. Local materials will accentuate the design. The public spaces have ben curated to enhance the expedition experience. Innovation abounds. In fact, I think Silver Origin will be an expedition game-changer. Basecamp is where guests can socialise before and after excursions. One of the most groundbreaking new spaces will be Basecamp, an elegant lounge where guests can socialise before and after excursions. More than just a meeting point, Basecamp represents the synergy between destination and ship. 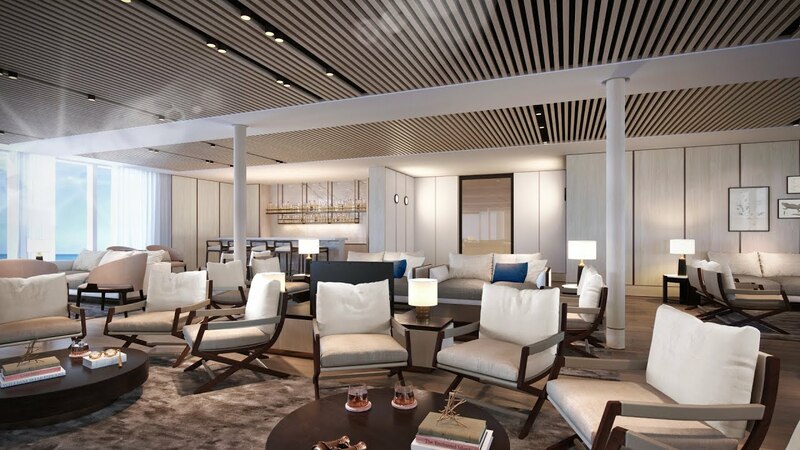 This luxurious lounge has direct connections to the Zodiac embarkation area. It will also host education programs that will make use of a large, interactive digital wall. The Explorer Lounge Terrance will boast a spectacular view aft. The connection with the destination will continue in the Explorer Lounge. This sophisticated space will have floor-to-ceiling windows for sweeping views of the Galapagos Islands. During the day it will host briefings and lectures from the ship’s Expedition Team, while in the evening guests will be able to relax in with a complimentary libation and piano entertainment. However, the Observation Lounge (shown at the top of this story) is likely to be the best place to soak up the spectacular panorama. It will be located at the very front of the ship and Silversea promise it will be an elegant hideaway . As is customary on Silversea the Observation Lounge will include a library, but this one will be unique. It will be carefully curated by Silversea’s destination experts. In fact it will be the most extensive destination-focused collection the cruise line has ever had on one ship. Culinary immersion will be part of the Silver Origin experience. Expert local chefs will take guests on a journey of culinary discovery in Silver Origin’s two dining venues: The Restaurant and The Grill. The intimate Restaurant onboard Silver Origin. Each venue will offer the international cuisine for which Silversea is renowned. In addition they will showcase the best of Ecuadorian culinary heritage with fresh, local ingredients and regional wines too. Silversea tell me that both The Restaurant and The Grill will be able to accommodate all guests at full capacity. Also, the open-air Grill can be partially enclosed for comfort. Silver Origin will raise the bar for luxury expedition accommodation. In fact, it will offer guests some entirely new features. There will be eight different suite categories, the largest of which will be the Owner’s Suite. It will offer an unprecedented view of the destination. The spacious Owners Suite onboard Silver Origin. The Silver Origin Veranda Suites will be a model of understated Italian elegance. Guests in every suite will have a private balcony, but in an innovative new twist some suites will feature a Horizon Balcony. It will convert to become an enclosed balcony with a floor-to-ceiling window for added space and better shelter from the elements. Deluxe Veranda Suites will have an ocean-view bathroom. Plus, in another first for Silversea, some suites will have an ocean-view bathtub – a real treat that’s previously only been available in some of the most expensive suites at sea. In addition, the shower will also have ocean-views and be accessible from the balcony too. Silversea tell me that Silver Origin will be one of the most environmentally friendly cruise ships ever built. It will boast state-of-the-art technology designed specifically for sailing the Galapagos Islands, like a dynamic positioning system that will enable Silver Origin to automatically maintain position without dropping anchor – thereby protecting the sea floor. Silver Origin will also reduce the amount of single-use plastic bottles by installing special freshwater purification systems in every suite. The waste water treatment system will meet or exceed the strictest regulations and Silver Origin will also meet the highest standards of energy efficiency in the segment. Silver Origin looks set to redefine expedition cruising – from cultural and destination immersion to on board luxury. For more information about Silver Origin visit the Silversea website.